We weren’t far into our babywearing journey when I realised I needed to give a little bit of extra thought to the clothes my wrappee wore when being carried. His lovely little knitted booties had fallen (been wiggled / kicked) off at least 20 times within the space of 30 minutes until I finally didn’t spot one falling to the ground and it was lost forever. He spent the rest of that morning wearing one of my mittens on his foot, secured by a hairband. 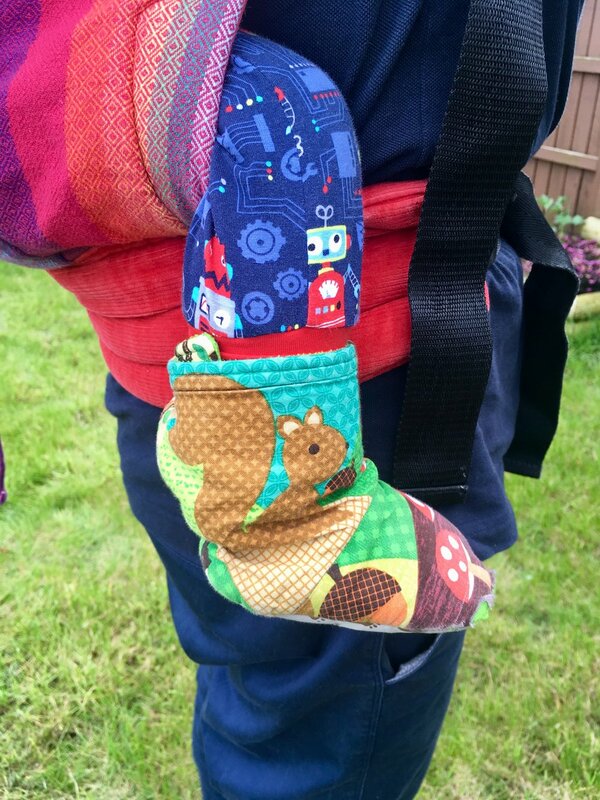 If you’re back carrying, you have no chance at all... hats, mittens, booties & socks will all be gleefully discarded without your knowledge, until that is, you get a disapproving look from A. N. Aplha Parent for ‘allowing’ your baby to have bare feet in the rain. These booties from Sewn Down Purple Lane are elasticated around the ankle & have two rows of poppers on the ankle for secure (baby proof) fastening. Aside from easily removeable accessories, there are a few things to think about when choosing your little one’s clothes to ensure that they’re comfortable and safe when you’re carrying them. The good news is it’s not rocket science, and it doesn’t have to cost any more than you’d normally pay. The awesome news (for a children’s clothes addict like myself at least!) is that there are some truly gorgeous babywearing-friendly togs out there if you know where to look! Going back to basics, whether you wrap or use a more structured carrier or sling, the ideal position for you little (or bigger!) one is the ‘M’ or ‘frog’ position with their knees spread apart and raised higher than their bum. This is a natural position for babies but is a bit tricky in inflexible or bulky clothing. Buttons, zips or firm waistbands can dig into little tummies, and stiffer fabrics can bunch up creating discomfort. If you use cloth nappies, these are usually chunkier than disposables and take up even more room in clothes. An ideal fabric for both babywearing and cloth bumming is jersey cotton. It’s soft, flexible, breathable and has enough stretch to ensure free movement. Increase the layers as it gets cooler, adding fleece in colder weather instead of bulky snow suits that can be dangerous as well as uncomfortable (here’s a great article from Sheffield Sling Surgery about babywearing in cold weather). When it’s warmer, reduce the layers, remembering to factor in each layer of wrap / carrier going over your little one (and here’s a great article about babywearing in hot weather). This snood from Swing & Rock has a shaped yoke that can be tucked down into clothes & ensures that there are no chilly gaps for little necks. I spent a good deal of time scouring the usual high street / supermarket purveyors of children’s clothes before realising that babywearing & cloth nappies don’t play a big part in their children’s wear design processes. T shirts and tops are pretty easy to find but often clothes from these retailers are made from stiffer, inflexible fabrics like denim, or canvas-like cotton, with the bums in trousers and shorts too slim fitting to accommodate a fluffier ‘cloth bum’ or to allow the free movement needed for comfortable babywearing. Luckily enough, there are a range of businesses offering absolutely beautiful clothes that are ‘cut for cloth’ (meaning they’re designed to accommodate cloth nappies) and designed for babywearing. If you like to support small or local businesses, there are some incredibly talented people making handmade baby and children’s clothes to order. I was pleasantly surprised to find that they’re comparable in price to the bigger names and often far superior in quality. Facebook is a great place to search. These Harem Pants from Swing & Rock have extra long cuffs that can be folded down when carrying for extra coverage. When you’ve located your lovely soft, stretchy, breathable clothes, it’s worth thinking about the little gaps in clothing that appear when babywearing. 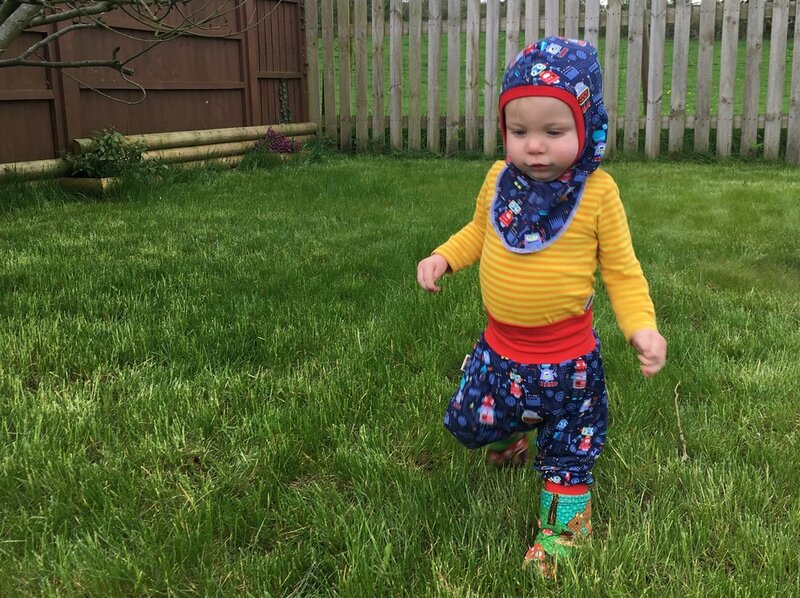 Leg warmers, extra long socks or fold-down cuffs will ensure that ankles don’t get cold or sunburned, while snoods, tube scarves or sun hats with flaps are good ways to protect little necks. Choose hats that fasten, and that cover or protect little ears. Can my baby / child move their legs freely into the ‘M’ position without restriction? Are the clothes free of buttons / zips etc. that may dig into them when being carried? Does the outfit protect against the cold, heat, rain or sun without being bulky or restrictive? Is the fabric of the clothes soft, breathable and comfortable? Will the outfit stay on / in place when your little one is being carried (I.e. survive all attempts by your little one to remove it and throw it into impossible to reach places).